I just got my new Waltzingmouse Stamps today and I could not resist inking up them up for the Waltzingmouse Sketch Challenge #88! 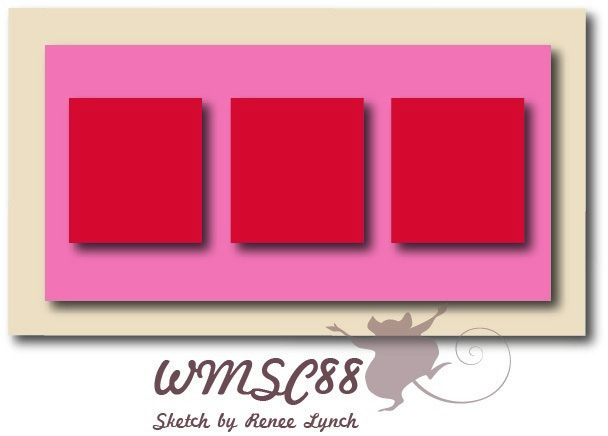 This week's sketch is from the super sweet and talented Renee Lynch! I have wanted this little bunny stamp for I don't know how long and he's finally mine:)! Something about his expression is irresistible! I just fussy cut him 3 times and popped him up over some punched grass. Easy-peasy! Since I already had him out, I did one more mini card! This time, he's a chocolate bunny. I put him in a gold "box" with a little cellophane. Seriously, how cute is that? I just know I'm going to have so much fun with these stamps! Thanks for visiting and I hope everyone has a wonderful weekend! 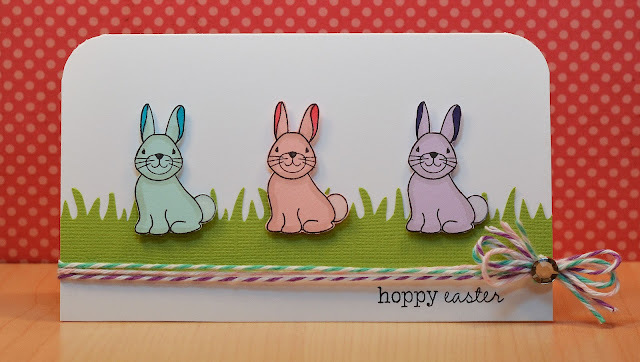 Such sweet bunnies, all perfectly colored in a row. Love the simplicity of the card with the little extra touch of the double twine wrap. And OH your chocolate bunny! Poor little guy in his package won't know what hit him, heeee! SO adorable....Great job, JJ! That really is one of the cutest bunny stamps ever! 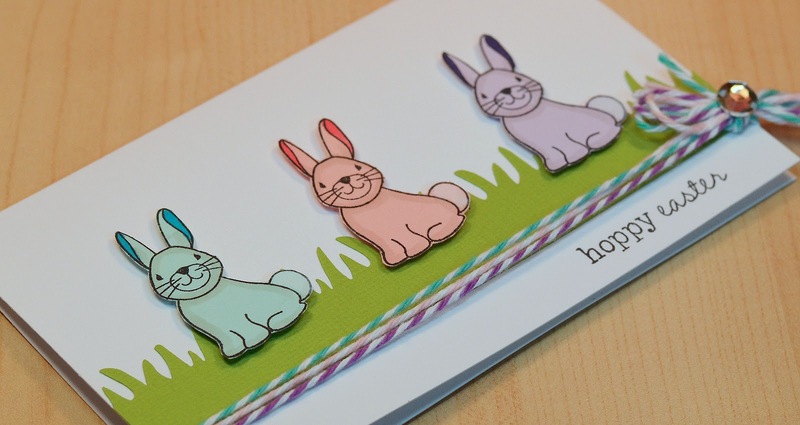 Love how you matched the twine to the bunnies and added a gem to the bow - so simple but so effective! The chocolate bunny is genius! 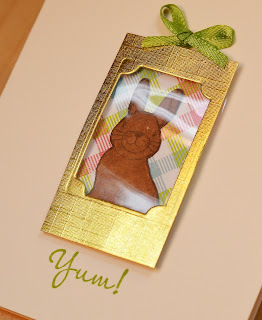 The label die you used for the window is perfect and I love the background paper inside. What a happy little Easter Card JJ! love the colorful little bunnies and the matching twine! 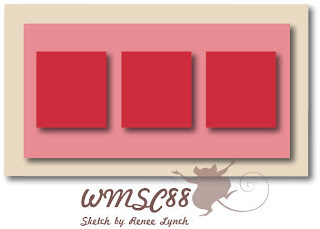 thanks for playing with the WMS sketch this week! Oh - and your chocolate bunny in the gold box is SO fun!! 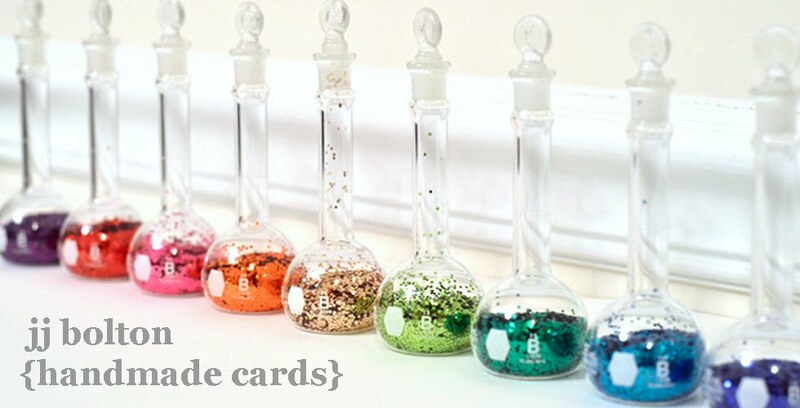 Both of your cards are just darling. I love that multicolored row of bunnies, and can't resist that chocolate guy either. Oh your bunnies are so sweet in the pastel colors, and the grass!!! I am seriously drawn to the chocolate bunny though behind the cellophane! And no not because of the word chocolate. Another head turner that is brilliant! I'm like how stinkin clever is that? Love it! The gold box is just genius use of the die and looks like it was meant for that reason. Have a great weekend.... Time to recharge your batteries !!! Wow, SO adorable! And I agree about this bunny. It is just the cutest thing ever. I just recently got this set and just love the little critters! 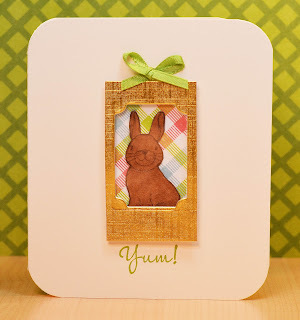 Adore how you did the bunny in three colors and used a trio of twine colors to match! Sweet, sweet Easter card!! Love your pastel bunnies JJ, a great CAS design, and the touch of twine is the perfect finishing touch! And how adorable is that chocolate bunny? Too cute for words!